Bingyi (b. 1975 in Beijing) is a contemporary polymath whose art practice encompasses land and environmental art, site-specific architectural installation, musical and literary composition, ink painting, and performance art. Using the traditional medium of ink on paper, she collaborates over months with environmental conditions to create reality-scaled records of topological and climatological forces, which are in turn recuperated in installations and performances. 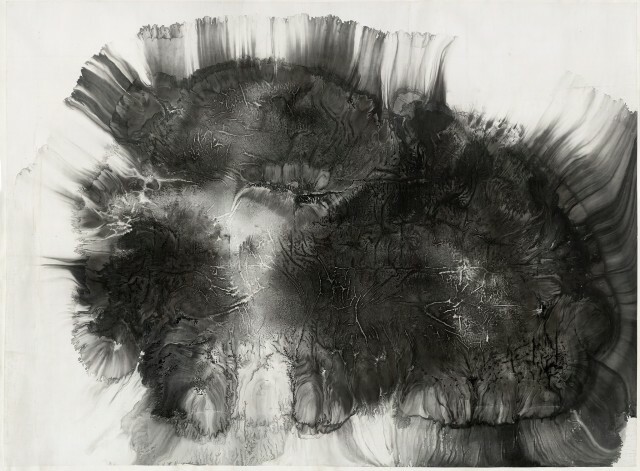 She thus uses ink—carbon, an absolute absorber of light, suspended in water—as “dark light” to illuminate the invisible processes that enable patterns and forms to emerge from chaos. In her serial paintings in the intimate fan format, Bingyi studies these processes in microscopic scale, cataloging the multifold virtual forms assumed by organismic life. Honed by a daily discipline in calligraphy, her brushwork embodies a generative expressionism that belies its apparent restraint. Through her hypnotic, obsessive endurance, one senses the loving power of nature itself as it crafts animate life from inanimate matter. Yet in the same finely-wrought manner Bingyi confronts nature at its most catastrophically indifferent to humans, creating a visual journey through the ruins of earthquake and flood. Painting on the brink of representability, she radically reworks the millennium-old language of ink landscapes that sublimated lived trauma into idealized nature. Intensive/Extensive, curated by Ink Studio Artistic Director Britta Erickson, surveys the full range of Bingyi’s practice. On the first floor, her massive 2013 work Wanwu is presented in a two-floor immersive environment, alongside her Luminaries series and video documentation of her past projects. On the third floor, the exhibition continues with the debuts of her encyclopedic series Fairies and her long silk handscroll Apocalypse, which recollects her experience of the aftermath of the 2008 Sichuan earthquake. Bingyi has exhibited in Museo de Arte Contemporaneo de Alicante, Alicante, Spain (2014); St. Johannes-Evangelist-Kirche, Berlin, Germany (2012); Smart Museum of Art, University of Chicago, Chicago, USA (2010); Galerie Erna Hecey, Brussels, Belgium (2009); Contrasts Gallery, Shanghai, China (2009); and Max Protetch Gallery, New York, USA (2008). Her works have also been included in Surveyors, Albright-Knox Art Gallery, Buffalo, USA(2011) and Yipai, the Opening of the New Wing, Today Art Museum, Beijing, China (2009), and featured at The 7th Gwangju Biennale, Annual Report: A Year in Exhibitions, Gwangju, South Korea (2008).